Context: High-intensity light emitting diode lamps with reduced exposure time to bond orthodontic attachments have been introduced to save the valuable clinical time. Aims: To evaluate the shear bond strength of brackets cured using three different light emitting diode curing units having different intensities and curing times, to compare the effect of different exposure methods on bond strength, and to compare the amount of remnant adhesive on tooth after debonding. Settings and Design: Study conducted on 120 brackets bonded to extracted premolar teeth cured by using three light-emitting diode (LED) units. Methods: One hundred and twenty adhesive precoated metal brackets (Gemini series, 3M Unitek) were cured using three LED curing units (3M ESPE, ELIPAR, S10; Ortholux™ LED; Ortholux™ Luminous Curing Light). 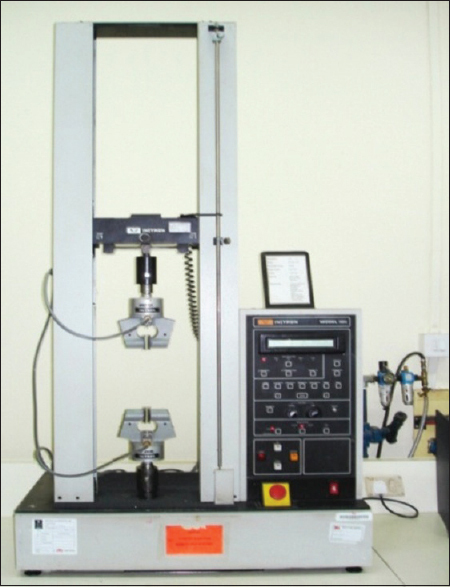 Universal testing machine was used to record shear bond strength. Residual adhesive remaining on the teeth was assessed by the modified adhesive remnant index. Statistical Analysis: After calculating mean and standard deviation for each group, post hoc Tukey and Kruskal–Wallis tests were employed to find the significant difference. Results: Comparison showed highest shear bond strength for Group 1A followed by 3A and lowest for Group 3B. Statistically significant difference was noticed in comparing shear bond strength recorded in Group 1A, Group 2A, and Group 3A with Group 1B, Group 2B, and Group 3B. Conclusions: Reduction of exposure time to 6 s with high-intensity curing light seemed to be clinically acceptable and should be recommended. Curing of metal brackets with single exposure from buccal side showed lower shear bond strength values. The introduction of acid etch technique by Buonocore  has made possible, the attachment of orthodontic accessories directly onto the enamel surface. The light-emitting diode (LED), a new technology for light polymerization has been proposed to overcome the shortcomings of standard quartz-tungsten-halogen–visible LCUs. LED light curing unit has a lifetime of over 10,000 h with relatively little degradation, require little power to operate, resistant to shock and vibration, lightweight, portable, and require no filters to produce blue light., All these positive aspects make them an excellent alternative to conventional halogen lamps. Stability of bonded brackets and the clinical time spent during bracket bonding are main concerns for every orthodontist. Hence, high-intensity LED lamps with a considerable reduction in the exposure time to bond orthodontic attachments are introduced to save the valuable clinical time. Manufacturers of new generation high-intensity LED units claim that they combine all the advantages of their predecessors with a considerable reduction in the curing time, but there is not much available information on theirin vitro orin vivo behavior. Therefore, this study was undertaken to compare the shear bond strength of brackets cured using three different LED curing units having different intensities and curing times, to evaluate the effect of curing time, light intensity and total energy density on shear bond strength, to compare the effect of different exposure methods (single exposure and exposure from two sides mesial and distal) on bond strength and the amount of remnant adhesive on tooth surface after debonding. This in vitro study was carried out on 120 human premolar teeth without caries or filling that had been extracted for therapeutic purpose in patients undergoing orthodontic treatment. After extraction, the teeth were cleaned to remove blood, soft tissue, and debris and were stored in distilled water containing crystal of thymol in closed container at room temperature until preparation and testing. One hundred and twenty adhesive precoated metal brackets (Gemini series, 3M Unitek) were used for bonding. Polymerization sources used were three LED curing units [3M ESPE, ELIPAR, S10 [Figure 1]; Ortholux™ LED; Ortholux™ Luminous Curing Light [Figure 2]. For bonding buccal surfaces of all premolar teeth were polished with a rubber cup and polishing paste for 30 s, rinsed thoroughly with water and dried with air stream. The area where the bracket was to be placed was etched with 37% phosphoric acid for 30 s and washed with water and dried. A layer of Transbond XT primer was coated onto the etched surface of all teeth. The excess primer was gently blown off using air stream. Each bracket was removed from its individual blister pack immediately before placement, positioned on the tooth surface, and pressed firmly in place. Excess adhesive flash was removed before light curing using a probe. Teeth with bonded brackets were divided into three groups of forty each according to light curing unit used, and each group was further subdivided into two subgroups with twenty teeth according to a method of light curing. Group 1A: Light cured using ELIPAR, S10 LED curing unit for 20 s by positioning the light guide on each interproximal side for 10 s.
Group 1B: Light cured using ELIPAR, S10 LED curing unit for 20 s with single exposure on buccal surface. Group 2A: Light cured using Ortholux LED curing unit for 10 s by positioning the light guide on each interproximal side for 5 s.
Group 2B: Light cured using Ortholux LED curing unit for 10 s with single exposure on buccal surface. Group 3A: Curing was done using Ortholux luminous LED curing unit for 6 s by positioning the light guide on each interproximal side for 3 s.
Group 3B: Curing was done using Ortholux luminous LED curing unit for 6 s with single exposure on buccal surface. Acrylic blocks made up of self-cure acrylic resin were used to mount the teeth to be subjected for shear bond strength test. Prepared teeth were centered in the acrylic blocks with the long axis of the teeth perpendicular to the base of the block. Acrylic blocks with the teeth mounted were stored in distilled water at room temperature before subjecting to shear bond strength test. 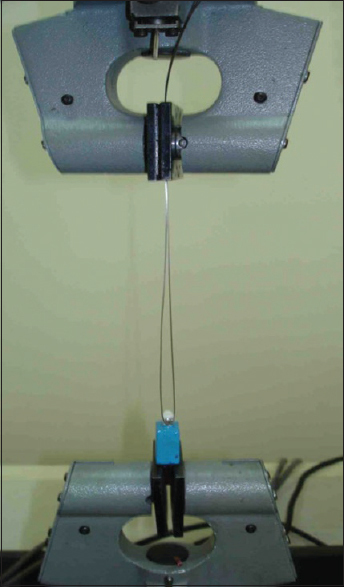 The shear bond strength test was conducted using a universal testing machine ([Instron 4301, Canton, Mass] [Figure 3]). Acrylic blocks were positioned in the Instron Machine with the long axis parallel to the direction of the load application. A stainless steel wire 0.5 mm diameter in the shape of a loop was fixed to the upper cross head at one end and was adjusted to engage the bracket at the other end. A load side density of 0–50 Kg was set in the Instron Machine, and the cross head speed was adjusted for 5 mm/min. An occlusogingival load was progressively applied till the bracket was debonded from the tooth surface [Figure 4]. The load at which the bracket debonded was recorded in Newtons and subsequently calculated in Mega Pascals. Following the debonding procedure, magnifying lens (×20) of a stereomicroscope was used to examine the enamel surface and bracket base of each tooth for residual adhesive. The residual adhesive remaining on the teeth was assessed using the modified adhesive remnant index (ARI). Score 5: No adhesive remaining on the enamel surface. For statistical evaluation of experimental data, the mean and standard deviation were calculated for each group. Post hoc Tukey test was employed to find the pairwise significance between the groups. The Kruskal–Wallis test was used to determine significant differences in the ARI scores between the different groups. Comparison of mean shear bond strength among all groups showed highest shear bond strength for Group 1A (ELIPAR, S10 LED curing unit for 20 s, 10 s on each interproximal side) followed by Group 3A (Ortholux luminous LED curing unit for 6 s, 3 s on each interproximal side), Group 2A (Ortholux LED curing unit for 10 s, 5 s on each interproximal side), Group 1B (ELIPAR, S10 LED curing unit for 20 s with single exposure on buccal surface), Group 2B (Ortholux LED curing unit for 10 s with single exposure), Group 3B (Ortholux luminous LED curing unit for 6 s with single exposure) [Table 1] and Graph 1]. To find out significant difference among groups, post hoc Tukey test was carried out. Shear bond strength values comparison among Group 1A, Group 2A, and Group 3A showed statistically insignificant difference. The statistical significant difference was present in comparing Group 1B with Group 2B and 3B. The difference in shear bond strength between Group 2B and Group 3B was found to be statistically insignificant [Table 2]. 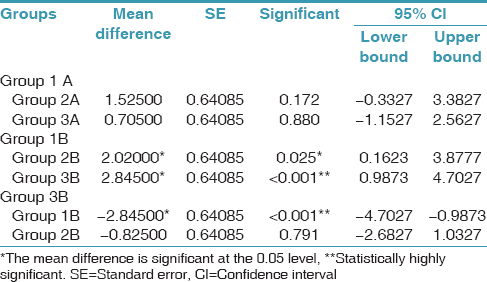 Statistically significant difference was noticed in comparing shear bond strength recorded in Group 1A, Group 2A, and Group 3A (positioning the light guide on each interproximal side) with Group 1B, Group 2B, and Group 3B (single exposure on the buccal surface) [Table 3]. Kruskal–Wallis test was used to find out if there was any significant association between the ARI scores in different groups. No statistically significant association was found between the ARI scores in all the groups [Table 4]. Achieving appropriate bracket bond strength is an issue of relevant clinical significance, as orthodontic brackets are subjected to clinical stresses applied by orthodontic archwires, chewing forces, or even iatrogenic stresses. A successful bracket adhesive must have adequate shear bond strength for its continued attachment during the required clinical period. Maximum conversion of monomer to polymer is necessary to achieve optimal physical properties of adhesive cements and depends on the composite composition, the light source, and the exposure time. Incomplete polymerization has been associated with bonding failures and inferior physical properties of light-cured composite materials. It has been suggested that bond strength values between 5.9 MPa and 7.8 MPa are sufficient for a clinically effective orthodontic bonding. 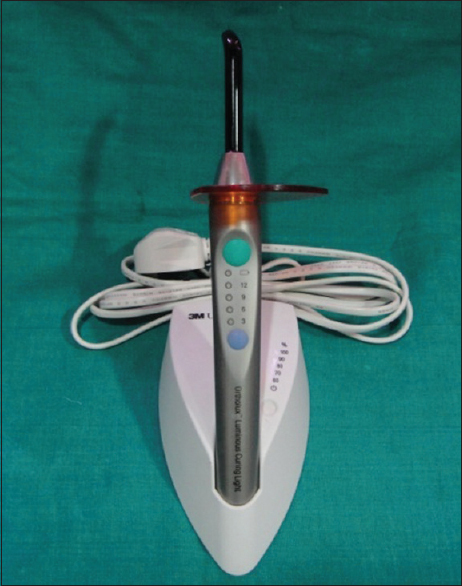 Despite innovations in curing light devices with short exposure time it has to be proven if this time-saving improvements have an effect on bond strength which is highly important for treatment outcome. High bond strengths are required to avoid bracket failure during treatment while on the other hand brackets should be removable without any enamel damage. The presentin vitro study, comparing shear bond strength of brackets polymerized with three different LED light sources, with different curing times and curing methods showed an increase in mean SBS as light-curing time increased for all three LED light units except for Group 3A (Ortholux luminous LED curing unit for 6 s, 3 s on each interproximal side). Increase in SBS with an increase in light-curing time is reported by many studies ,,,,,,, and this relationship is probably due to the higher rates of monomer/polymer conversion that occur with the increase in light-curing time. One fact contributing to the level of polymerization in addition to a time interval is light power. Higher the light power, greater is the number of photons reaching the composite resin and higher the number of free radicals available for the conversion of monomer into polymer. Higher shear bond strength value for Group 3A can be explained by the high mean power of Ortholux luminous (1600 mW/cm 2) LED curing unit. In addition to irradiation intensity and exposure time, conversion of monomer into polymers in composite resins also depends on total energy released (energy density). Higher is the energy density, higher is the degree of cure and mechanical properties.,, In this study, the total energy released was highest in the Group 1 followed by Group 2 and lower for Group 3. Mean shear bond strength values were higher for Group 1A, 2B followed by Group 2A, 2B and lower for Group 3B except for Group 3A. In this study, comparing curing light single exposure from buccal side, with two sides exposure (mesial and distal) showed significant difference with single exposure from buccal side showing lower shear bond strength values. Curing from buccal side blocked the light, requiring a transmission mechanism that was provided by reflection in the tooth structure. The curing device tip was therefore applied to the edges of the brackets, with the light falling directly on the tooth surface that reflects it onto the adhesive system under the bracket. This procedure resulted in light absorption and scattering, reducing the light intensity and the amount of energy delivered to the resin cement. Despite the high intensity of the light, when too short exposure times was used, the energy supplied seemed to be insufficient, leading to unsatisfactory polymerization, and lower shear bond strength values. The results of this study suggested that there was no significant difference in ARI scores among the groups, with the predominant score being 3. The type of light unit used does not affect the location of orthodontic bond failures since the majority of these occurred at the bracket–composite resin interface (score 3) with all light units. This indicated that the weakest part of the bracket/tooth interface was the inadequate cohesive strength of the orthodontic composite near the bracket caused by an insufficient degree of cure., As light radiation was supplied by tooth reflection, the adhesive system in contact with the tooth was closer to the light source, and so, easier to cure. This could, however, diminish the probability of damage to the enamel during debonding, which is advantageous. Thus LED light curing units with intermediary energy density used for longer exposures led to a higher degree of cure than did curing with high energy densities for shorter exposures. However, we cannot ignore the shear bond strength values which were higher than the required clinically acceptable bond strength provide by LED light curing unit with high light intensity and short exposure time thus making the use of new high-intensity curing devices comparable to the LED units previously available. From a clinical point of view, reduction in chair time is advantageous allowing the orthodontist to attend a larger number of patients and thus compensating for the higher expenditure on purchasing the units. Reduction in curing time also results in a lower risk of contamination by saliva, thus increasing bond strength and reducing the rate of orthodontic bracket debonding. An important factor to consider in regard to increased light intensity of the curing source is the heat generated in the resin-based composite being cured. If excessive heat is generated during the curing of the composite, it could be transmitted to the surrounding tissues and pulp, causing them damage. The temperature increase during orthodontic bonding depends on power density, exposure time and light-tip tooth surface distance. Different studies have shown contradictory results regarding heat generation during curing by LED curing units.,,, So while using high-intensity LED curing unit with shorter exposure time heat generation should be considered before clinically using the light for curing. Evaluating bond strength is a sensitive experimental procedure, and the same bonding materials can yield different results due to variations in experimental conditions. Light sources also generate different light intensities over time depending on the quality and age of the lamp creating variation in the results. As oral conditions are difficult to simulate in the laboratory, the results obtained should be interpreted with caution and clinical validation is necessary before any product or technique is universally accepted. Light curing intensity and time did not influence the ARI score. Johnson WT Jr., Hembree JH Jr., Weber FN. Shear strength of orthodontic direct-bonding adhesives. Am J Orthod 1976;70:559-66. Keizer S, ten Cate JM, Arends J. Direct bonding of orthodontic brackets. Am J Orthod 1976;69:318-27. Bassiouny MA, Grant AA. A visible light-cured composite restorative. Clinical open assessment. Br Dent J 1978 5;145:327-30. Jandt KD, Mills RW, Blackwell GB, Ashworth SH. Depth of cure and compressive strength of dental composites cured with blue light emitting diodes (LEDs). Dent Mater 2000;16:41-7. Sfondrini MF, Cacciafesta V, Scribante A, Klersy C. Plasma arc versus halogen light curing of orthodontic brackets: A 12-month clinical study of bond failures. Am J Orthod Dentofacial Orthop 2004;125:342-7. Mills RW. Blue light emitting diodes – Another method of light curing? Br Dent J 1995;178:169. Dunn WJ, Taloumis LJ. Polymerization of orthodontic resin cement with light-emitting diode curing units. Am J Orthod Dentofacial Orthop 2002;122:236-41. Banerjee S, Banerjee R. A comparative evaluation of the shear bond strength of five different orthodontic bonding agents polymerized using halogen and light-emitting diode curing lights: Anin vitro investigation. Indian J Dent Res 2011;22:731-2. Reyonlds IR. A review of direct orthodontic bonding. Br J Orthod 1975;2:171-8. Paschos E, Kurochkina N, Huth KC, Hansson CS, Rudzki-Janson I. Failure rate of brackets bonded with antimicrobial and fluoride-releasing, self-etching primer and the effect on prevention of enamel demineralization. Am J Orthod Dentofacial Orthop 2009;135:613-20. Usümez S, Büyükyilmaz T, Karaman AI. Effect of light-emitting diode on bond strength of orthodontic brackets. Angle Orthod 2004;74:259-63. Mavropoulos A, Staudt CB, Kiliaridis S, Krejci I. Light curing time reduction:In vitro evaluation of new intensive light-emitting diode curing units. Eur J Orthod 2005;27:408-12. Gronberg K, Rossouw PE, Miller BH, Buschang P. Distance and time effect on shear bond strength of brackets cured with a second-generation light-emitting diode unit. Angle Orthod 2006;76:682-8. Yu HS, Lee KJ, Jin GC, Baik HS. Comparison of the shear bond strength of brackets using the led curing light and plasma arc curing light: Polymerization time. World J Orthod 2007;8:129-35. Bhardwaj A, Padmanavan S, Rajgopal, Mathur AM, Gupta A. Comparative evaluation of shear bond strength and debonding characteristics using conventional halogen light curing unit and LED light curing unit: Anin vitro study. J Indian Orthod Soc 2013;47:272-9. Heravi F, Moazzami SM, Ghaffari N, Jalayer J, Bozorgnia Y. Evaluation of shear bond strength of orthodontic brackets using trans-illumination technique with different curing profiles of LED light-curing unit in posterior teeth. Prog Orthod 2013;14:49. Ansari S, Gupta G, Gautam R, Kalia A. 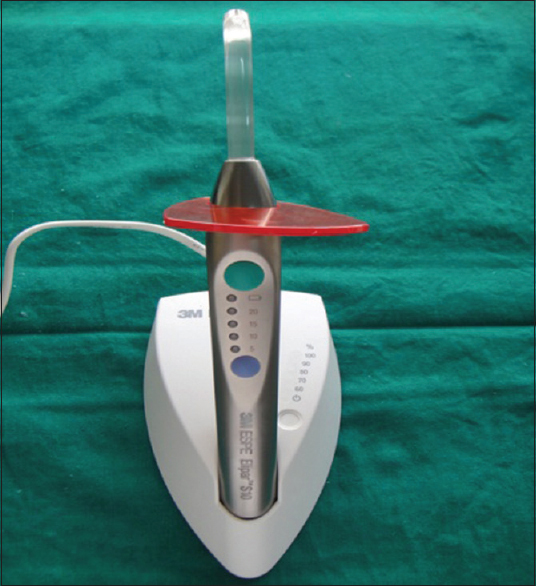 Evaluation of different brands of LED curing devices for bonding metallic orthodontic brackets. Dentistry 2014;4:252-4. Rueggeberg F. Contemporary issues in photocuring. Compend Contin Educ Dent Suppl 1999;25:S4-15. Niepraschk M, Rahiotis C, Bradley TG, Eliades T, Eliades G. Effect of various curing lights on the degree of cure of orthodontic adhesives. Am J Orthod Dentofacial Orthop 2007;132:382-4. Dall'Igna CM, Marchioro EM, Spohr AM, Mota EG. Effect of curing time on the bond strength of a bracket-bonding system cured with a light-emitting diode or plasma arc light. Eur J Orthod 2011;33:55-9. Peutzfeldt A, Asmussen E. Resin composite properties and energy density of light cure. J Dent Res 2005;84:659-62. Feng L, Carvalho R, Suh BI. Insufficient cure under the condition of high irradiance and short irradiation time. Dent Mater 2009;25:283-9. Gomes P, Portugal J, Jardim L. Effect of high-powered LED-curing exposure time on orthodontic bracket shear bond strength. Rev Port Estomatol Med Dent Cir Maxilofac 2014;5:78-82. Ozturk B, Ozturk AN, Usumez A, Usumez S, Ozer F. Temperature rise during adhesive and resin composite polymerization with various light curing sources. Oper Dent 2004;29:325-32. Asmussen E, Peutzfeldt A. Temperature rise induced by some light emitting diode and quartz-tungsten-halogen curing units. Eur J Oral Sci 2005;113:96-8. Wahbi MA, Aalam FA, Fatiny FI, Radwan SA, Eshan IY, Al-Samadani KH. Characterization of heat emission of light-curing units. Saudi Dent J 2012;24:91-8. Aksakalli S, Demir A, Selek M, Tasdemir S. Temperature increase during orthodontic bonding with different curing units using an infrared camera. Acta Odontol Scand 2014;72:36-41. Türkkahraman H, Küçükesmen HC. Orthodontic bracket shear bond strengths produced by two high-power light-emitting diode modes and halogen light. Angle Orthod 2005;75:854-7.